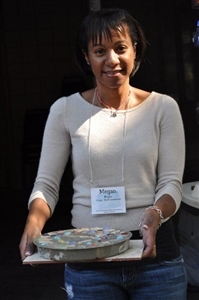 A 2011 Retreat participant shows off her completed "Make It and Take It" enrichment--a stepping stone embedded with her mosaic design. For busy, stressed out women looking for a time of rest and renewal, the 28th Annual FLUMC Women’s Retreat offers four weekend sessions this winter. To be held at the Life Enrichment Center in Fruitland Park, the retreat carries the name “Promise of Hope.” Sessions will be held January 20-22, February 3-5, February 17-19 and March 2-4. “The minute you drive onto the property (at the center), you know it is a holy place--you can leave all your cares at home,” said Deb Davis, who has been a part of the retreat team for 12 years and manages the quality assurance for the speakers’ presentations. She’s also observed the positive effect the weekends have on attendees. The purpose of the retreats is to provide women a time to intentionally come away from the responsibilities of their homes, children, families, and jobs and to set their feet on holy ground; and to meet Jesus Christ face to face. Speakers, Bible study leaders, music leaders and other staff, including the “Make It and Take It” enrichments, will vary from weekend to weekend, but the intention will be the same. For more information, or to register, go to www.flumcwomensretreats.org.